Title : Who's Got Gertie? And How Can We Get Her Back! This is the 3rd book in the Stevie Diamond mystery series. It is worth reading in chronological order but not necessary. #3 is my personal favourite Stevie Diamond book. It always takes me back to summer vacations spent in Vancouver. The descriptions are simple but still manage to create a great atmosphere.In #3, Stevie and Jesse are trying to stay out of a hated summer camp for little kids. They are just about to go when Gertie, their older next door neighbour, rescues them. Now they have the summer to themselves, as long as they check in once and a while.Everything is going swimmingly until Gertie disappears. Where did she go? Why didn't she tell them? Wait, did someone TAKE her? They begin interviewing suspects. Their interviews turn into investigations until they are actually following a suspect. Their investigation gets more and more intense. With everything going on, they still must keep up appearances with their parents too!In this adventure, the 2 sleuths have to make up disguises, track a person from the classified-to an airport-to a hotel, stalk a suspect and much much more.This is a great read! 4 STARS "This Stevie Diamond Mystery is a compelling and fast-paced adventure to keep readers guessing until the very end. Stevie and Jesse are in the thick of things once again. While they're helping Gertie, their 72-year-old neighbor, prepare for her big movie, something goes missing -- Gertie! The Diamond and Kulniki Detective Agency has another mystery to solve, and suddenly there are more exciting things than day camp to think about." (From Amazon)This is a bit like Harriet the Spy/Encyclopedia Brown but a Canadian version. A great novel for any child. 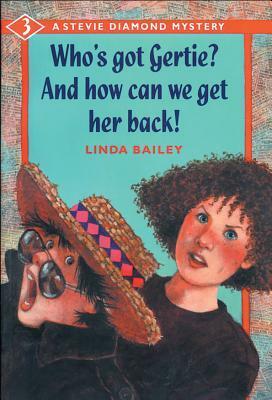 Linda Bailey - I was born and grew up in Winnipeg —a daydreamer with her nose in a book. In my twenties, I traveled around the world, mostly by ship. Later, I moved to Vancouver, where I earned a B.A. and M.Ed. at the University of British Columbia. Among my jobs were travel agent, college teacher, instructional designer and editor.For years, I dabbled with writing. But I didn't begin to write in earnest until I had two young daughters. My first book was published in 1992, and I have since written more than thirty others, including novels, picture books and non-fiction. I live in Vancouver, a short walk from the sea. I write full-time and still love to travel, read and daydream. - SourceSeries:* Stanley* Stevie Diamond Mystery* Good Times Travel AgencyAwards:Arthur Ellis Award◊ Best Juvenile (1997): How Can a Frozen Detective Stay Hot on the Trail? ◊ Best Juvenile (2000): How Can a Brilliant Detective Shine in the Dark?